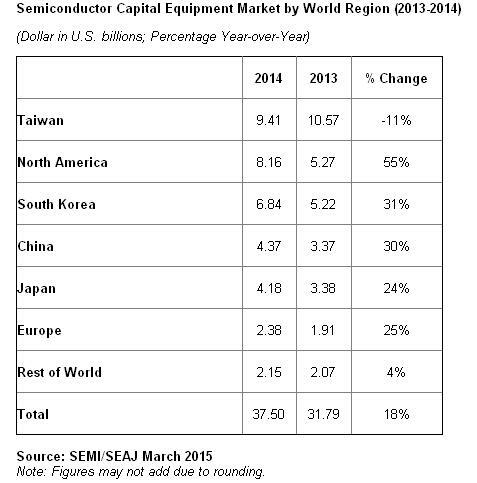 Semiconductor equipment body SEMI reported worldwide sales of $37.50 billion of worth of semiconductor manufacturing equipment in year 2014, an year-over-year increase of 18% compared to 2013. Semiconductor equipment covers wafer processing, assembly and packaging, test, and other front-end equipment. Other front-end includes mask/reticle manufacturing, wafer manufacturing, and fab facilities equipment. Taiwan, where the world's number one semiconductor fab TSMC is having its big factory remained the largest market for new semiconductor equipment for the third year in a row with $9.41 billion in equipment sales. The North American market which has highest number of semiconductor fabrication facilities held onto the second place with $8.16 billion in sales; South Korea with Samsung and other memory manufacturing facilities maintained its third position with total sales of $6.84 billion. China, which is a newbie in this domain has moved up in the rankings, surpassing Japan with $4.37 billion in sales. SEMI said "The global assembly and packaging segment increased 33 percent; total test equipment sales increased 31 percent; other front end equipment segment increased 15 percent; and the wafer processing equipment market segment increased 15 percent. " SEMI also reported North America-based manufacturers of semiconductor equipment posted $1.31 billion in orders worldwide in February 2015 (three-month average basis) and a book-to-bill ratio of 1.02.